THIS RELEASE IS NO LONGER AVAILABLE FROM THE BOLTFISH CATALOGUE ON CD. HOWEVER, YOU CAN STILL PURCHASE IT VIA DIGITAL DOWNLOAD DIRECTLY FROM US. "'Light Turned On' is an autobiographical album. Each song's title represents not only something about the song, but about myself over the last year. The album is about finally waking up and realizing what and who is important in my life. Each song represents a certain mood/emotion that I have felt over the making of the album. I wanted the album to be very electronic but at the same time have an organic human feel. I implemented this through the use of recordings from around my apartment and outside my apartment. I wanted to convey the deep emotions as well as the daily hum drum of going to work, making dinner, etc... In this way I synced recordings of playing around on my desk, handling dishes, and jingling keys to a rhythm. Most of my influence has come the likes of Trentemoller (first and foremost), Robert Babicz, BT, and others that embrace organic electronic music. The album took about a year to complete is my greatest accomplishment up to this point in my life." "It might be too early to deem Philadelphian Ben Runyan one of our "expert knob twiddlers" (though the photo gracing his artist page on the Boltfish site shows him enthusiastically doing just that), but his full-length entrance onto the world stage as City Rain is a step in the right direction. Apparently a personal memento/reconciliation writ sonically, I’m dubious that young Runyan’s amassed the requisite life experience(s) that should imbue Light Turned On with the gravitas he feels it deserves—such speculation aside, however, this is a superb debut of charmed electronica. Sharply-honed and texturally inventive, Light Turned On does beckon numerous ghosts from rusting machines; were the tracks not so imagistically forged, the dreaded "indietronica" virus infecting a number of them (mostly by a few opportunist guitar/piano cells) might well have tragically metastasized. Thankfully, Runyan treats such pseudo-Boards of Canada-isms as earnest dogma rather than smug affectation. Hence, the poignant digital Americana (replete with distant thunderswells and Budd-ing keys) of "Back on Track" remains on solid footing courtesy of humid, twilight atmospherics and a snappy laptop rhythm that buttresses the Fahey-esque fingerpicking throughout. More importantly, Runyan’s wise to let his leftfield tendencies rule the day: foregone 90s blip-techno arms the cleverly-titled "Face for Books"; "Well You Said" and "Click Clack" are exercises in adolescent nostalgia subsumed by glitch profundity; the fetching "Chasing Leaves" reads like a digital etch-a-sketch, balancing its rhythmic tempo between dribbling high-frequencies, cricket chatter, and sounds that quiver like charged jello. As warm urban precipitation, Light Turned On deftly illuminates the IDioM, shaped to make your life easier." "Light Turned On" is a debut CD of City Rain, a one-man project of Ben Runyan, who resides in the US and is producing glitchy electronic music, experimenting within IDM and industrial musical domains. He has also been involved in several "Laptop Battles" in the USA where he has achieved top placings. Light Turned On is issued on British label Boltfish Recordings, that has a long discography of IDM/ambient electronic artists and is the one that attracts talented musicians, giving them the opportunity to issue their debut CDs. Apart from "Light Turned On" City Rain issued tracks in digital format on Trance4M8 and on Boltfish as well, appeared with a remix on Obfusc’s "City of Cedar" album and had various other appearances with tracks titled "Click Clack" and "Poker Face". It is a very personal album as it deals with Ben Runyan’s everyday life during the year of this album composition. As he comments himself, he used field recordings for its creation – inside and outside of the appartment, to make the sound more organic and natural. He used really different sounds of everyday life – like the sound of rain or dinner preparation, building the rhythms based on jingling keys, playing around the desk and things of that kind, noticing the rhythms of everyday life many people neglect and don’t pay attention to. Apart from natural sounds, this album is sated with artificial, electronic ones as well – the sounds of daily being are surrounded by numerous complex IDM glitches and scratches, slight noises, echoing and dissolving in ambient background soundscapes that are put down into basic and sometimes quite simple rhythm structure which depends on the track. Apart from that one can notice a various usage of acoustic guitar on this album, which was performed both by Ben Runyan (on tracks "12", "A Familiar Warmth", "Back on Track", "Face for Books" and "Well You Said") and Will Lewis (on track "Left You a Letter"). Soft textures make you think about urban life, a city in different periods of the day and year, transparent, peacefull tracks with a slight touch of melancholy as "Mia" remind the early mornings after the night rain, when the streets are not crowded with people and not suffering from traffic jams. Frequent melody lines, sometimes harmonious, sometimes avantgarde, remind of improvisations. Each track, drawing a unique episode continues the previous one and all together they build up a story, one year of city life, one year of a person, named Ben Runyan. Thematic cover artwork, showing a switch on the bare wall on the one side and light-bulb, hanging on the wall together with a piece of paper that looks like some kind of a schedule on the other, fullfilled in different tones of yellow and green looks both cozy and quite "industrial", reflecting the images, brought by this CD, representing both city sights and home moods." "this record will certainly continue to earn its keep in my rotation"
"...an expressive vehicle that ignites beacons and shows the way with the light of the sound it produces." "For a debut outing, Runyan’s seamless blend of modern micro-beats, crystalline synth textures and field recordings reaches levels of ingenuity at times. The found sounds are accumulated from various sources revolving round his everyday life, offering a personal touch to what can be an emotionally detached style of music. Whether it is the vehicle sounds found on 'Left You a Letter', the distant storms featured in 'Philadelphia' or the downtown atmospherics highlighted in 'Back on Track', time and time again Runyan proves to posses a considerable compositional poise. Part of the album’s charm is trying to decipher the origins of each sound." "...one of those records that compliments hazy Indian summer nights." 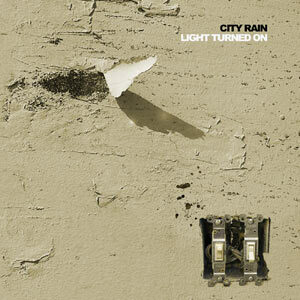 "The next release in Boltfish's non-CDr series comes from American artist City Rain. It's an absolutely lovely journey through melodic electronic music that engages you from the off. Nicely put together tracks that use a fair amount of live instrumentation as well as classic crunchy rhythms and gentle chord sequences. It's a melancholy album, and no mistake, and you can tangibly hear the love that's gone into it. As a debut work I've got to say this is superb and I'll definitely be looking forward to hearing more in the future. Props to Boltish for once again delivering a delicious album and props to the artist as well. Gorgeous." "Philadelphian Ben Runyan (aka City Rain) cites Trentemøller as his foremost influence—a good thing!—and the material comprising his self-professed autobiographical release Light Turned On perpetuates Trentemøller's dedication to polished design and emotive melodicism. Apparently, Runyan wanted the album to exude a palpably human and organic feel and so worked found and field sounds compiled from his immediate environment—clattering dishes and jangling keys, for example—into the compositions (something heard immediately in the opening "12"). Moods run the gamut in City Rain's expansively-arranged constructions: we're transported to a storm-tossed seaside in "Back on Track" with laid-back trip-hop beats augmented by acoustic guitar and melancholy keyboard flourishes, synths sing blissfully over an acid-tinged strut in the jubilant "Face for Books," and church tones descend from on high during the ruminative meditation "Philadelphia." Light Turned On clearly indicates, however, that Runyan's more drawn to the reflective side of things; his romantic side gets an especially nice workout in the wistful "Mia" where radiant tones tinkle and sparkle over gently pulsating rhythms. With eleven tracks totaling thirty-nine minutes, Runyan also shows himself to be commendably concise in his approach—if only more producers would follow his example—and likewise demonstrates a fine-tuned command of production skills. " "I’d say he’s done a fine job of delivering a fascinating album."